Troma Entertainment turns down the Oscars to attend AVN Awards! 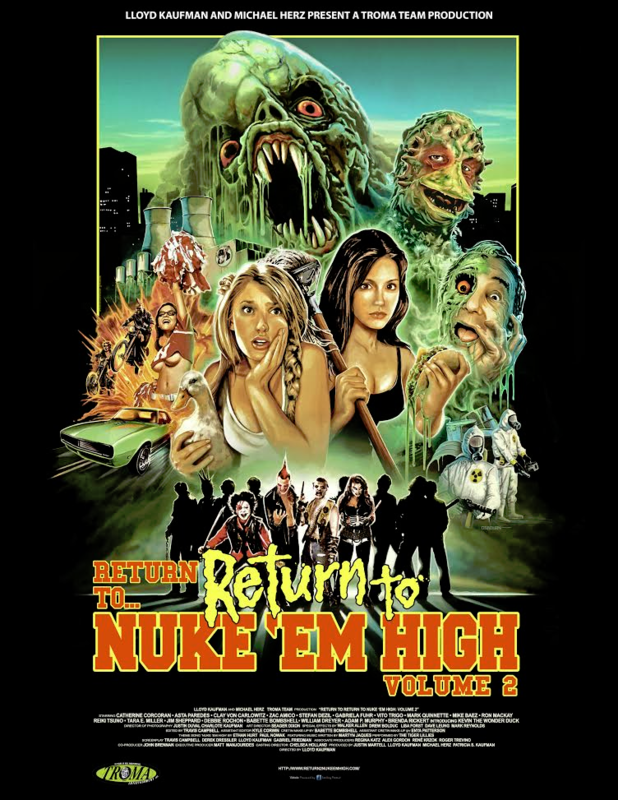 Troma, an independent film company known for The Toxic Avenger, Class of Nuke ‘Em High, and SGT. Kabukiman N.Y.P.D., has been honored many times over their 43 years. Their films have been shown to millions of people, touching the souls of young and hungry artists, ready to join the truly independent art movement. Troma has been lauded by numerous celebrated institutions such as the American Cinematheque, Cinemathèque Français, the British Film Institute, the American Film Institute, and the Museum of Modern Art. These achievements and honors have kept the independent film company’s flame ablaze throughout this troubling time of cinematic disparity. But, after 43 years of making Movies of The Future, Troma has finally reached the pinnacle of success, an invitation to an event so prestigious that it dwarfs the Oscars, Golden Globes, and Sundance. This year, Troma Entertainment has been honored, but mostly humbled to be attending the 34th Annual AVN Awards in Las Vegas, Nevada. Saturday, January 21st, 2017, Lloyd Kaufman, President of Troma Entertainment and creator of The Toxic Avenger, along with Toxie, Kabukiman, and Kabukiman’s Cocktail Corner creator John Brennan will walk the sticky red carpet at the Hard Rock Hotel, it was reported by Levi White, Head of Public Relations at Troma Entertainment, Inc. Bad Dragon, the toy maker, is responsible for this great honor. No word on if Mr. Kaufman will be presented with a Life Time Achievement award, but rumors are that his obligatory politically charged speech will make even social justice warrior Meryl Streep wet. Tromadance Film Festival is now taking submissions. No entry fee and no rear entry fee! Mr. Kaufman’s AVN companion and inviter, Bad Dragon, will be promoting their unique line of award winning toys. Founded in 2008, Bad Dragon is a one-of-a-kind company, offering extensive customization of its products; every toy is available in a choice of colors and firmness as well as custom color options. Event attendees and Troma fans alike will be able to view a hot load of Bad Dragon products on display during the Adult Entertainment Expo Jan. 18th-21st, as well as take pictures and get autographs from Mr. Kaufman at no charge. The Troma Team will be handing out exclusive Troma merch such as T-Shirts, Mini Posters, and other accessories for free. In addition to attending the AVN Awards, Mr. Kaufman and Mr. Brennan will be working side by side with Troma icon, Sgt. Kabukiman, as the Sgt. films an hour long special for his hit YouTube series “Kabukiman’s Cocktail Corner.” In this psychedelic talk and sketch show, host Sgt. Kabukiman NYPD shares Troma-themed adult beverages, interviews truly independent artists, and enjoys an eclectic range of musical performances. Guests have included BRIAN QUINN of Impractical Jokers, YouTube sensation the ANGRY VIDEO GAME NERD, comedian DAVE HILL, world renowned tattoo artist PAUL BOOTH, DOUG GILLARD of Guided By Voices, and many more! Michael Herz (Vice President of Troma Entertainment) recently green lit “Kabukiman’s Cocktail Corner” for a second season, along with an hour-long special, “Kabukiman’s Cocktail Corner: Loaded in Las Vegas”, which will film on location at the 2017 AVN Awards. This entry was posted on Thursday, January 19th, 2017 at 1:55 pm	and is filed under Events, News. You can follow any responses to this entry through the RSS 2.0 feed. You can leave a response, or trackback from your own site. You are here : Home » news » 2017 » 01 » 19 » Troma Entertainment turns down the Oscars to attend AVN Awards!